The city of Strobilis was established in antiquity on the Bithynian side of what is now the Gulf of Izmit, a place where travellers on the way to Prousa (now Bursa) could rest after the short sea crossing. After the establishment of Constantinople in the 4th Century, Strobilis was referred to as Pylai and is now called Çiftlikköy. For a while, it appears to have been commonly called Karakilise after this rather lovely brick church (40.668449, 29.316273). Justinian appears to have closed the road through Nicomedia (Izmit) in the 6th Century (Özger-Byvas (2012) p8), which increased traffic through Pylai. Being the least swampy area for some distance, this became most important port in western Bithynia. The small city appears to have become prominent from the 11th century when some of the later Byzantine emperors built palaces there. 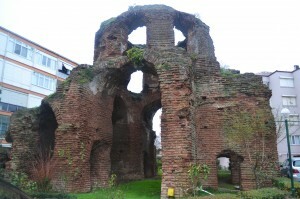 Fragmented Byzantine remains can be found in the area but intact buildings are rare. Karakilise seems to have been built in Justinian times. It is unusual in being built completely of brick rather than of alternating courses of brick and stone. It clearly had a makeover in Paleologian times and the existing form of the church is late, rather than Justinian, Byzantine. 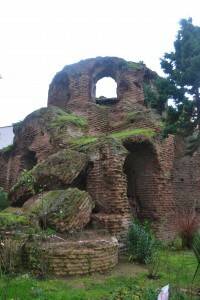 It is a cross-in-square church with a high drum from which the dome has collapsed. 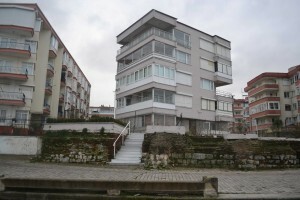 It sits uncomfortably within the fences and buildings of Başkent 1 Sahil Sitesi, an aging resort complex, sparsely populated in winter and giving the impression that it will crumble away long before the church. Karakilise has survived many earthquakes and, despite having no maintenance since the fall, survives relatively intact, albeit skeletal. 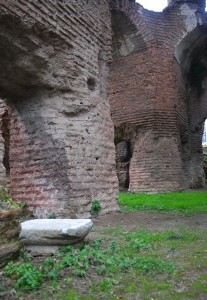 Mamboury studied the building in 1947 and postulated an 8th century foundation date. Mango investigated in 1962 and thought a 5th century origin seemed more likely, referring to the edifice as a baptistery (Jevtik, 2016). In 1976, Mango called it a ‘cruciform, secular building’ (Mango 1976). Perhaps its role in the place here was similar to that of the Octagon in the Great Palace in Constantinople – an impressive churchlike building for the pleasure of the emperor. Close by are the remains of a fortress built by Manuel Comnenus in the mid-12th century. This must once have been a wonderful exhibition of Byzantine architecture. Jevtik, I. 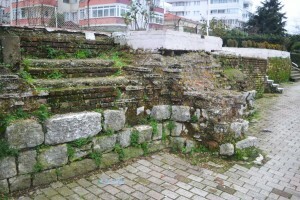 (2016) Yalova, Çiftlikköy, ancient Pylae or Pylai, Yalova Termal, ancient Pythia. Limen Project. Available online at: http://www.limenproject.net/wp-content/uploads/2014/07/yalova.pdf Retrieved 29 May 2018. 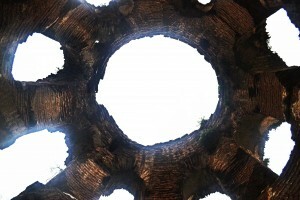 Mango, Cyril (1976): Byzantine Architecture. Abrams, New York.